The year 2005 saw some big changes in WWE. Long gone were the days of The Rock and Stone Cold Steve Austin as the company's two top stars, and WWE was looking to fill that void with it's two newest main event players, John Cena and Batista. Sadly, we had the untimely death of one of the greatest performers of all time, Eddie Guerrero. As overwhelmingly sad as that was, there were still positives. WWE RAW and SmackDown were generally entertaining shows every week and the majority of WWE pay-per-view events were generally well received. The year 2005 did bring us many fantastic wrestling matches. In fact, WWE even gave us some of the best matches we have ever seen. And that brings me to what I feel are the top 10 best WWE matches of 2005. This is now a pretty infamous match. It was a dream match that, while still a good watch, was still ruined by both men as it could have been so much more. The story goes that WWE wanted to do at least two, maybe three matches between them. The second match was already planned for a few months later, a Steel Cage match. The plan was for Hulk Hogan to go over at SummerSlam (which he did) and Shawn Michaels to win the cage. And the day of the event, Hogan claimed to have upcoming minor surgeries that would keep him out of the ring for at least a year and thus scrap the matches. Shawn Michaels in turn, now angry over not getting his win in a rematch, decided to hilariously oversell everything Hogan did to him in the match. While it was very funny to see, it still could have been so much better of both had just stuck to the original plan. However, it is still a good and fun match to see. 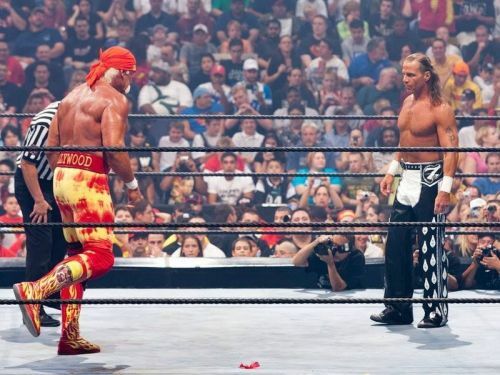 It wasn't until early 2018 that Shawn Michaels finally commented on his overselling in the match, claiming that he feels he didn't actually oversell anything and that WWE asked him to be the heel Shawn Michaels of the '90s and ''that is how the heel 90's Shawn Michaels sold''. He also said no matter how anyone feels about Hogan today, it was an absolute honour to be in the ring with him.